When renderings of the new Apple campus in Cupertino, California appeared on the scene in June we were stunned by its innovative shape, now we’ve learned that the new circular spaceship building, designed by Foster and Partners, will have one of the largest corporate solar roofs in the country. New building plans released by Apple to the city of Cupertino show the solar canopy will cover the entirety of the main rounded structure as well as the stand-alone parking structure. Estimates put the structure’s square footage at just over 500,000 which would make the array a whopping 5 megawatt system, allaying our fears that Apple will run their new campus on natural gas. 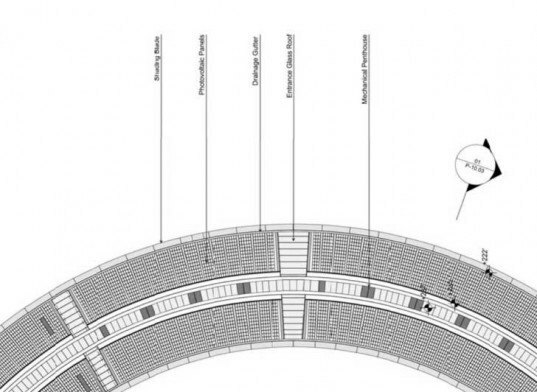 The original presentation that the late Steve Jobs gave to the Cupertino City council in June was impressive simply because of the scale and thoughtful layout of the project. 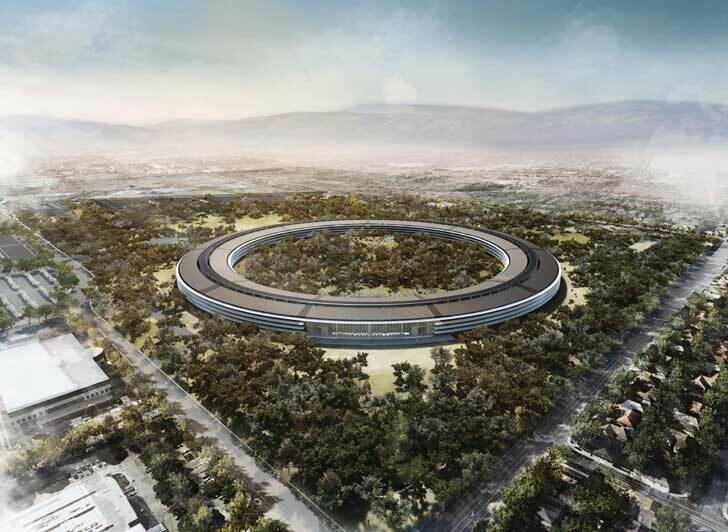 The rounded building allows Apple to leave their campus with mostly green space, reducing the current plot’s asphalt by 90% and planting 60% more trees than are currently growing there. The vertical parking structure is part of what relieves the need for asphalt, and it is to be built partially into the ground and topped with its own solar array to generate energy. The City of Cupertino is currently reviewing public comment and compiling an Environmental Impact Report which will be assessed this coming spring. Though the eventual environmental plusses of the new Apple campus are great — a 5 MW array is not a small feat — the process of building this gigantic new space could pose many a problem. Apple has to demolish 2.65 million square feet of existing building and office space in order to clear the way for their mega-structure to be built. We’re sure this issue and many others are being hotly debated by the Cupertino City council and we’re hoping that the impact of construction of this gorgeous and very green building will be as small as its eventual weight on the grid. When renderings of the new Apple campus in Cupertino, California appeared on the scene in June we were stunned by its innovative shape, now we've learned that the new circular spaceship building, designed by Foster and Partners, will have one of the largest corporate solar roofs in the country. New building plans released by Apple to the city of Cupertino show the solar canopy will cover the entirety of the main rounded structure as well as the stand-alone parking structure. Estimates put the structure's square footage at just over 500,000 which would make the array a whopping 5 megawatt system, allaying our fears that Apple will run their new campus on natural gas.